Safeguard your home/office appliances, electronics and connected devices with this V7 7-outlet surge protector. Durable and strictly tested, this device features 7 surge protected outlets (6 standard and 1 transformer-spaced), EMI/RFI filtering and offers up to 1200 joules of surge protection. The low profile wall plug and keyhole mounting offer convenient installation. The V7 7-outlet surge protector provides unsurpassed power protection and peace of mind. 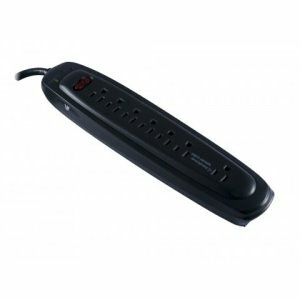 Safeguard your home/office appliances, electronics and connected devices with this V7 7-outlet surge protector. Durable and strictly tested, this device features 7 surge protected outlets (6 standard and 1 transformer-spaced), EMI/RFI filtering and offers up to 1200 joules of surge protection. The power that comes onto your home or office is not as dependable as you may think. Ever notice that sometimes the lights dim when a large appliance starts. That’s a power dip and it could cause your computer to suddenly shut down or restart. Hope you recently saved your work. Ever worked through and electrical storm, chances are that some of that power got caught up in the commercial power supply. If it spike the power supply in your PC your whole system could be destroyed beyond repair. But don’t worry there’s a simple and economical solution you can take to protect from power drops and spikes. Just connect your computer and other power sensitive equipment to a V7 surge protector. Electromagnetic and radio frequency interference can cause additional power spikes and power noise disrupting your power sensitive equipment. The V7 surge protector will condition and isolate your line power from any unwanted EMI and RFI currents and safely keep them out of your equipment. Too much amperage can be a dangerous and can lead to fire. The V7 surge protector has a built in 15A circuit that will continuously monitor the amount of current your devices are pulling and automatically shut off the power if there is an unsafe current surge. Just look for the red light to know that the power is on. Two additional lights indicate your devices are grounded and that the surge protector is monitoring the line power insuring that your sensitive electrical equipment is kept safe. Turn it all off with just one switch when it’s time to power down after your shut off your systems.